Another rainy weekend again... grey dark skies set the tone. The rain is soft rain with no sign of heavy winds or thunder. Truth is, I don't mind it at all. There is something incredibly appealing and soothing about the rain. I am happy and secretly glad that I can stay indoors this day. No goal in mind beyond the joy of having a quiet and relaxing day. Besides, I am easy to please and don't require much more than my favorite room, a good book, some fresh flowers and a cup of warm tea. And how blessed to have been able spent this sweet rainy day doing exactly what I love. Reading, writing, and listening to the sounds of the rain.. How about you, do you love rainy days too? How beautiful my friend. 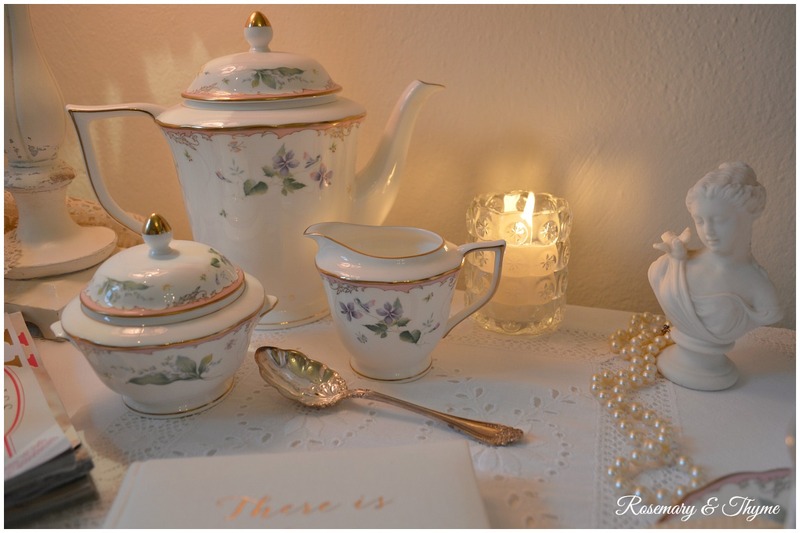 Your china for tea time is stunning and along with such a gorgeous setting for a little tea. I love rainy days and we had one today Sunday and I enjoyed it as I was posting a new entry. Have a great trip to R.I., sounds wonderful the visits to those fabulous mansions. Have a blessed week amiga querida. Thank you Fabby. Your comments are always a delight to read. I love to post on those rainy days too. It had just ... It was real summer days. But the rain has its charm! Yes, the rain certainly has its own charm and magic. Thank you for visiting. I do appreciate your comment. your photos are always so BEAUTIFUL! 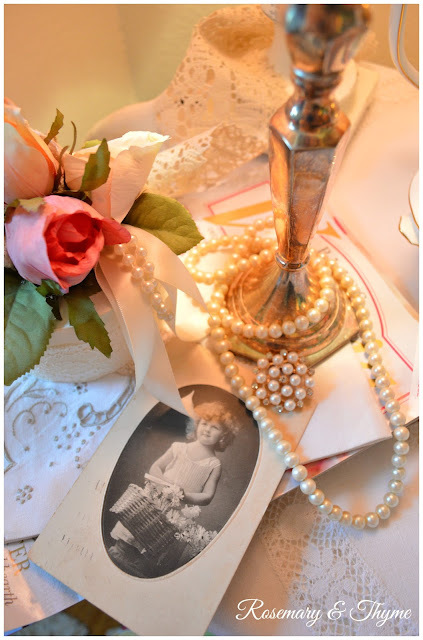 You create the loveliest vignettes! We've had lots of rainy days here too Janet, and because we need it here so much, I am content to busy myself in the house and fluff a bit. Thanks so much June. Your sweet words make me truly happy. Rain is always well received here. Especially by our grass. Let us look forward to warm sunny days. Great photos and you are so right, sometimes I love rainy days just because I love reading and writing, an excuse to stay inside. Thank you. I am delighted by your visit and grateful for your kind words. Yes, rain is always the perfect excuse to remain indoors. Hi, Janet, and thank you for another beautiful blog post in my inbox. I just told a friend that receiving a new post from your blog is like a refreshing visit to a spa for fhe spirit, and having tea served there too. What bettef refreshes one's being? You are not terrible far from me here in southeastern Pennsylvania but now that I live in an apartment, I am denied garden blessings. They now come via your blog. Thank you for sharing with us as you do. I, too, love the rain, and always have as I find it a renewal of sorts, except of course when extended and damaging. One of my greatest walks was at the edge of the Atlantic in Massachusetts at the beginning of a nor'easter. Now that I have several joints that need replacement ASAP, I dread the build up to the rain because the drop in barometric pressure results in increased pain, but once the rain falls, I am renewed. 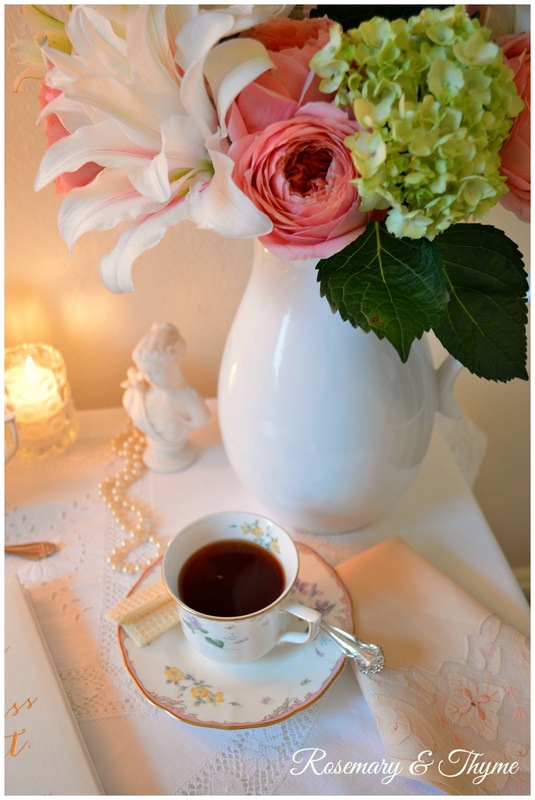 It must be a great delight to be able to sit down for tea with your friends, in the beauty you create. 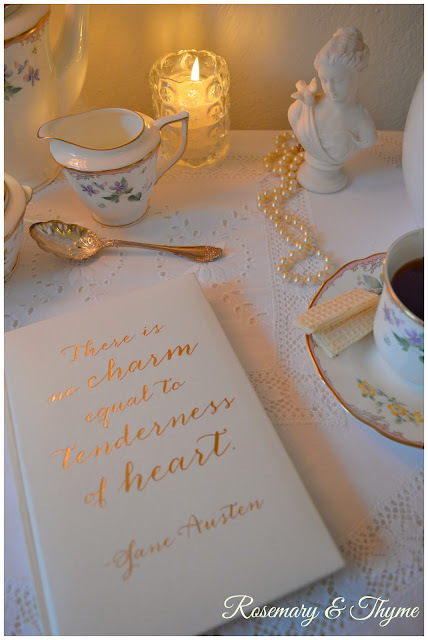 Thanks for the lovely Jane Austen quote and for renewing me after a pain-filled weekend. Oh Nancy, what a touching and inspiring comment. You truly touched my heart. I often wonder if my posts are read by anyone or if they bring any joy to the people that see the photos I post and having read your heartfelt message reminded me of how one person can bring a smile to someone's day. I am sorry to hear that you are such pain. I only pray that your illness improves soon. It would be a pleasure to have you join me for tea in my garden someday. Thank you for inspiring me and for reminding me to believe in my work. You will love my next post too which is a tea in my garden. Blessings to you Nancy. You are a sweet soul. I love a rainy day, I like to watch the rain fall as well as listen to it. I love to listen to the rain too. It is soothing and relaxing. As I grew up in the Northwest, I *love* rainy days! I'm the weirdo in California now that is so happy when it rains (don't even need a raincoat). One of my favorite things is to sit by the open window drinking tea or coffee and reading. It looks like you enjoyed doing just that!! 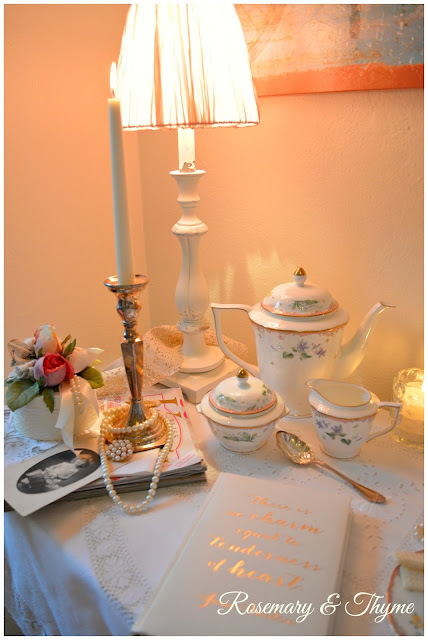 I'm always in awe of your pretty and elegant displays Janet.Never tired to look at those very chic vignettes. How wonderful to have you visit me today. I am moved by your kind words and appreciate your support. Hello sweet friend. I hope you are having a wonderful week. I am touched by your sweet words and thank you for your visit. This is a joyful treat for me today to visit you and your charming gentle blog. Oh, I am so glad you visited today. It gives me great joy to know that I have inspired. Thank you for such a pretty comment. Oh, Janet, your flowers are gorgeous! 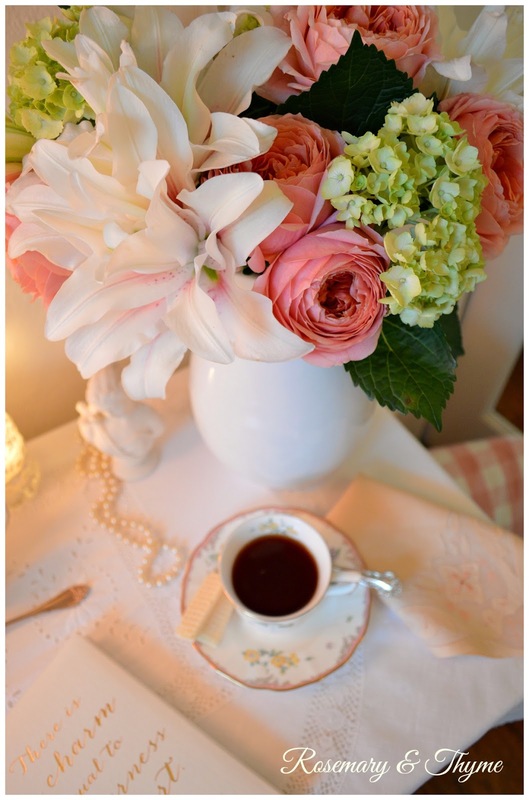 Who wouldn't enjoy a cup of tea with that beautiful bouquet near by! I like a rainy day if we only get one. I don't like to be negative but the trouble with rainy days here on the Island is we oftentimes get too many in a row and we're pretty sick of rain by the time it's all over. And too many times there is wind involved so, I prefer a sunny day myself. ;-) Enjoy your long weekend and thank you so much for sharing your pretty post with us. I love the Jane Austen quote too. So pretty! I also enjoy cozying up indoors on rainy days. 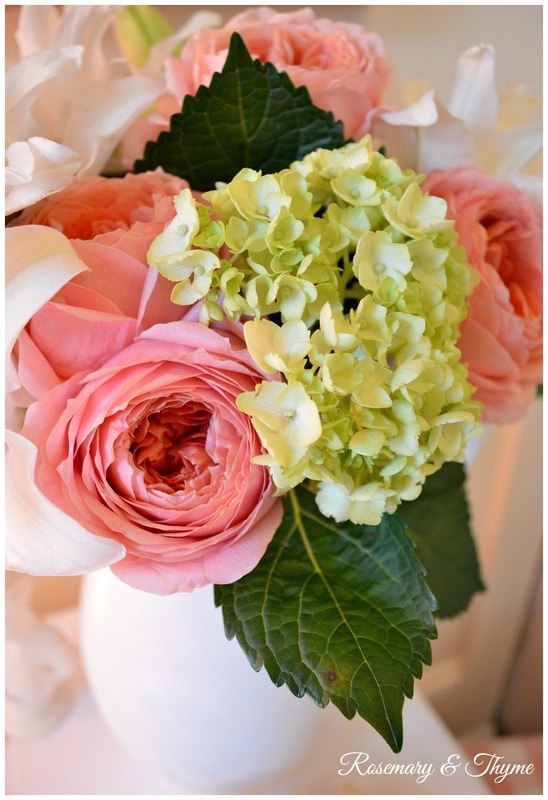 Loved all your beautiful vignettes and pictures, Lovely flowers too. A rainy day is most usually my favorite kind of day, especially when I am able to stay home. 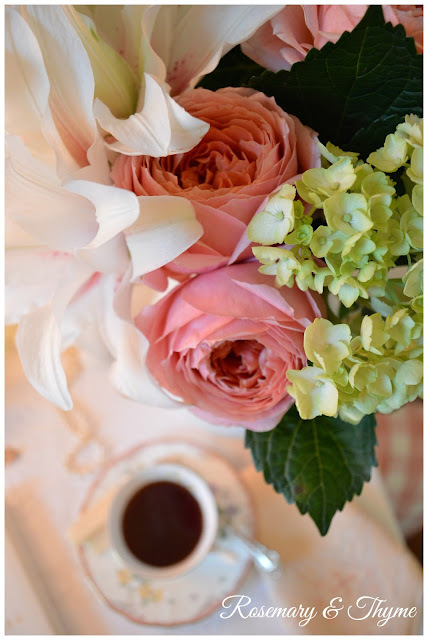 You're right, a good book, tea, flowers and a cozy room combine to make a most restful and perfect day. I love rainy days spent at home with a good book and some flavoured coffee. Your vignettes are always beautiful! Thank you for another so beautiful post, to come and visit you always fills my heart with gladness, dearest Janet, thanks most sincerely for this !